Modern shipping is all about change. New vessel shapes, designs, and capabilities are evolving like never before. In our Crewtoo construction series, we look at those technical changes…this time around, we steer in the direction of the rudder. 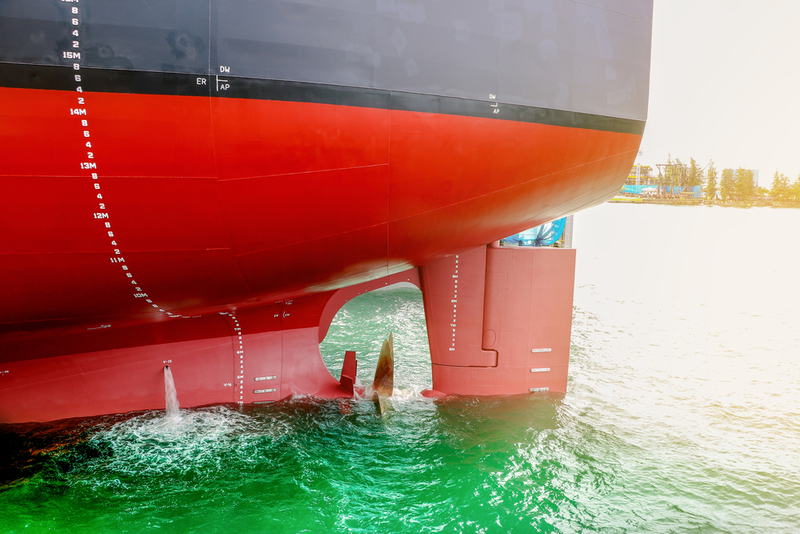 A ship’s propeller is vital – it provides the thrust needed to propel the vessel through the water. Which is great. However, without control and direction, then all that power is pretty useless. That is where the rudder comes in. The rudder is the primary control surface used to steer. It operates by redirecting the fluid past the hull. This then creates a turning or yawing motion to the craft. Turning the vessel to port or starboard, as desired. If you have ever been on a car journey and stuck your hand out of the window, you will have experienced the push and pull exerted as the wind passes over your hand. At one point, with the air directed on the palm, the hand will veer upwards. Then with the hand angle lowered, the push is downwards. This is, in essence, how the rudder works – but directing the flow of (in the ships’ case) water. In its most basic form, a rudder is a flat plane or sheet of material attached with hinges to the ship’s stern. Often rudders are shaped so as to minimise hydrodynamic drag. They are connected by hydraulic rams to the steering controls and are pushed or pulled into the right angle to make the vessel turn or move straight. Control of ships has always been vital – after all, if it doesn’t go in the right direction, it is not much use to anyone. There have been different types of steering controls over millennia – and these have often involved large boards through to steering oars. Indeed, the steering gear of ancient vessels were often side mounted and acted to provide a drag on one side with allowed the vessel to turn. A third term, steering oar, saw an oversized oar or board to control the direction. It was normally attached to the starboard side in larger vessels. Rowing oars set aside for steering appeared on large Egyptian vessels long before the time of Menes (3100 BC). In images of ancient Egyptian vessels, as many as five steering oars could be found on each side of passenger boats. This perhaps showed that a rethink was needed, and the introduction of a tiller and upright steering post abaft reduced the usual number of necessary steering oars to one each side. Apart from side-rudders, single rudders on the stern have been found in a number of tomb models of the time. By Roman times ancient vessels reached extraordinary sizes, and so control was a real issue. The Romans used steering oars – the Romans could often also use galley rowing crews, and by making one bank of oars row while the others stopped or lay in the water – then the vessel could turn sharply. The Vikings also favoured steering oars, as an oar could be lifted when raiding into shallow waters. Sternpost-mounted rudders started to appear on Chinese ship models starting in the 1st century AD. The world’s oldest known depiction of a sternpost-mounted rudder can be seen on a pottery model of a Chinese junk dating from the 1st century AD during the Han Dynasty. This predates their appearance in the West by a thousand years. Many junks also incorporated “fenestrated rudders” (rudders with holes in them, which supposedly allowing for better control). Detailed descriptions of Chinese junks during the Middle Ages are known from various travellers to China, such as Ibn Battuta of Tangier, Morocco and Marco Polo of Venice, Italy. Though the Chinese approach did not conform to the idea of rudders as we know them today. They were attached to the hull by means of wooden jaws or sockets, while larger ones were suspended from above by a rope tackle system so that they could be raised or lowered into the water. The refinements of the Chinese rudders, and the fact that far better control could be provided by a centre lined, stern mounted rudder meant that this was the approach which would then become the norm over the next thousand years. The introduction of the centreline rudder, first on the ships of northern Europe and then on Mediterranean vessels, was a technological development of great importance. Another major turning point for the development of rudders was the fact that vessels were increasingly calling into harbours, and then docks, which were developed for the use of ships. No longer was the depth of the rudder the primary concern – as they were no longer on simple river berths or beaches. The development of ports also allowed for the development of rudder designs. So, we reached a point where the stern was the agreed best placement, and the rudder could be fixed in place. This then allowed for a far more evolved system of pins and hinges (or pintles and gudgeons), as they did not have to be quickly removed or disassembled. Then there also came a change in propulsion, and even the materials used for shipbuilding. Sail gave way to steam, and wood to steel. The modern, industrialised vessel would have a large steel rudder – which would be hung astern of the propeller. Thus, the thrust of the propeller could be translated into lateral movement. The basic designs of rudder now are balanced, semi-balance or unbalanced. Which refers to how much of the rudder is astern of the rudder stock. The stock is the vertical shaft which the rudder is hinged from, and which is connected to the steering mechanism. Becker rudder – The Becker-type rudder has a moving flap on the trailing edge. When the rudder moves, a mechanical linkage diverts the flap to a higher angle to maximise the sideways thrust. Either 45 or 65 degrees maximum rudder angles can be specified for bigger and faster rudders. Flap rudder – A high-lift rudder which consists of a blade with a trailing edge flap activated by a mechanical or hydraulic system, thus producing a variable flap angle as a function of the rudder angle. Flettner rudder – A special design of flap rudder which uses two narrow flaps at the trailing edge, one above the other. What do you think? Are the days of the rudder over? Will ships be looking to azimuth pods for their steering and control in the future? We would love to hear from you.